Very clean. Convenient to touring especially the south. Most of all, very kind and gracious, accommodating hosts. Our only negative is that the bed mattresses could have been more comfortable. We really enjoyed our stay. The apartment was very clean and well situated for exploring the island. The view from the balcony was spectacular. Catherine, the host, is very friendly and a good ambassador for the island. We will be back! Lovely detached cottage atop a hill with fresh breezes (and no mosquitoes) overlooking Le Marin bay. Excellent location in peaceful nature 5 minutes from town. 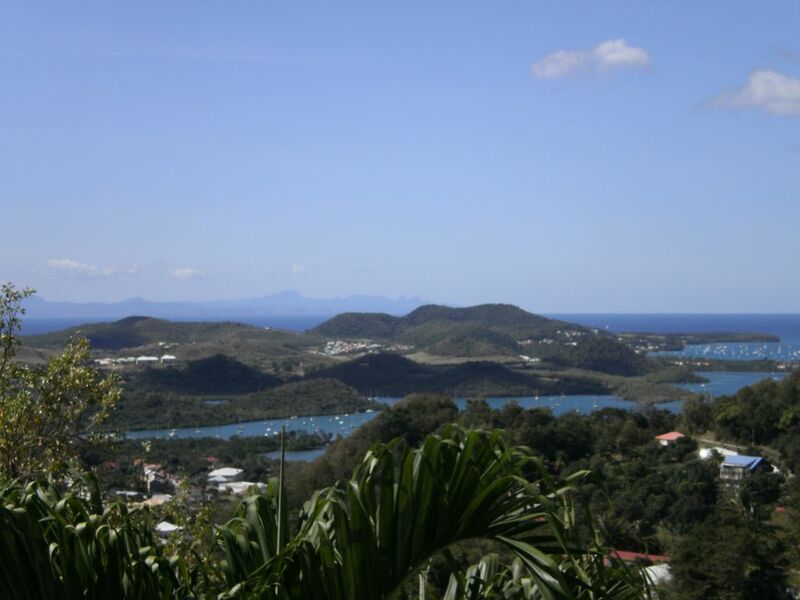 Also strategically located to reach the many beautiful beaches of southern Martinique. The house itself was roomy, very well equipped and comfortable. The strong wi-fl signal, washer, barbecue and other amenities a real plus too. Best of all were the wonderful hosts. Catherine has lots a good information and tips on how to enjoy Martinique. Their friendly hospitality was superb. As language challenged Americans we also appreciated being able to converse with our helpful hosts in English. Highly recommend! Wonderful vacation in Catherine's rental! Catherine's appartement was clean and well-organized with everything we needed. It has beautiful views over hills and the bay. We enjoyed the constant breeze going through the place. Thanks to that we were never too hot and did not have any mosquitoes. No need for AC nor screens! Thank you, Catherine and Serafino, for sharing your love and knowledge of the island, fauna and flora with us too. Our stay at Catherine and Stefano's place in Le Marin was wonderful and relaxing. Catherine and Stefano are wonderful hosts whose knowledge of the country and advice on where to go were invaluable in making our visit to Martinique as enjoyable as it was. The apartments they rent out are spacious, well apportioned, and airy with scenic views from the balcony and windows of Le Marin bay. They are well situated in the hills just outside the city of Le Marin with easy access to stores, markets and restaurants. The charming town of Sainte-Anne (great bakeries, restaurants and bars and a good outdoor market) is just about a 5 minute drive and the amazing Grande Anse des Salines beach is just about 10 minutes away. My family and I liked the place, and Catherine and Stefano, so much that we are planning on going back there next year. Rien à redire ! La location est située dans un cadre verdoyant et très calme avec une vue magnifique sur la baie de Ste ANNE et les environs. Etant venus avec un couple d'amis, nous avons apprécié l'aménagement intérieur confortable qui nous laissait toute intimité et aussi la grande salle du bas bien agencée et laissée à notre disposition. Mais en plus de tout cela nous tenons à remercier les propriétaires pour leur gentillesse et leur disponibilité. Nous garderons un excellent souvenir de notre séjour et pensons bien revenir dès qu'il nous sera possible.